This is extracted from a short diary written during my week-long residency at Hogchester Arts in Dorset. 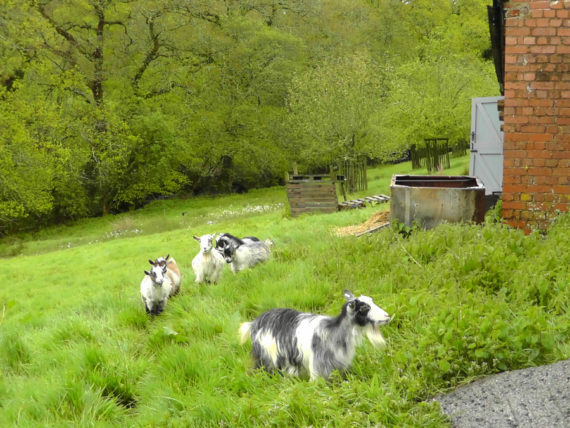 Hogchester is a small-holding and nature reserve offering residency opportunities for artists. It’s run by artist Chantal Powell and her husband Rob and I was invited to stay at the farm by Chantal through a connection made with my friend, artist Dean Melbourne. Think about GPS – how to use my phone to make work? This place is lovely. After a long train and bus journey from Birmingham a tramp over 2 fields, a bit steep and muddy in places, bought me to the farm by the back route. Met by Chantal, we sat in the sun surrounded by pygmy goats and talked about landscape, animals, illness, story and myth. Chantal admits that she is a town girl, bought up on an estate and that the impetus for the work on the land comes from her husband, Rob. I’m looking forward to walking around the farm with him at some point and finding out more about his vision. I had a quick look at Chantal’s studio, where I have been invited to work at any time. It’s really lovely and strangely intimidating. As my practice is not studio based I didn’t feel particularly comfortable. I’m incredibly tired. Not much sleep last night, maybe 4/5 hours. I never do sleep well when I am travelling the next day. Fear of missing the train maybe. Anyway, part of me wants to go out and explore the space and part of me just wants to go to sleep. I’m still thinking about output – thinking about audience response rather than my own interest. Must try to be selfish this week though. My first instinct is to look at the map (thinking this might be an interesting place to start with workshop participants too) Anyway, I’m looking for evidence of ancient places on the map – also interested in stuff that is not seen, for instance, the sea is unnamed on this map. I’m also interested in the things that are named as this is a totally unknown landscape to me. Slept well, up at 8. Somewhat overwhelming this morning, so much to explore. Of course, no wind (for making drawings). But no complaints really as it is a beautiful, sunny day, much welcomed after this long winter. I think I might start with recording sounds here – am also going for a walk with Rob around the farm later. “Am I afraid of drawing?” This though came to me as I was leaving the cottage and I think the answer is yes. I am afraid/frustrated that I cannot draw what I see. I’m surprised by this thought. I spent a lot of time recording sounds today; the stream, wind in the trees, some of the animals. Also videoing stuff and taking pictures. I started leaning the camera up against the tree trunks, looking up at the crown. This is really interesting – the tree branches make great drawings of course, but also, I like the weighty stillness of the trees seen from this angle. Drawing rivers on the map. So today was busy. I started a couple of wind/rain drawings. I wanted to work in the Quiet Space more because I feel I need to get used to being in there, loving the cottage which is quiet and peaceful. After this I went for a walk through the fields near the house. I noticed that there are animal tracks crisscrossing all the fields. Some are made by the goats, who walk in a very orderly, single file along them, even the babies fall into line. Others must have been made by foxes or deer maybe as they are in fields where the goats don’t go. In the pm I recorded a podcast segment and made some drawings with trees. I fell asleep after lunch and came up to bed at 7pm. Reading and knitting. Feel really tired. Still can’t figure out how to use the animal paths in my work, but I really want to. I like following them. Making drawings with trees. I feel that my job is to stand before nature as a witness. Thinking about what it is to be human as I spend time each day either with the goats or in the company of trees. Are humans here to witness? Is that what our consciousness is for? Thinking about the animal tracks. The Way. Tao. The Way of The Goat – Pan, Beltane. Is walking the Way of the Goat like walking a labyrinth? I cut some tracing paper into small sheets that would fit inside one of my walking devices. I walked along animal track in the goat field. 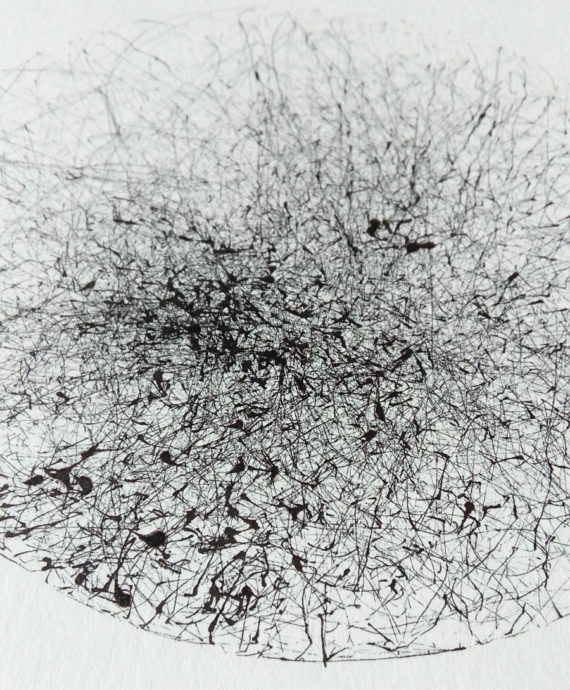 At the start of a track I fed a fresh sheet of tracing paper into the drawing device and then followed the track. At the end of a track, or at a junction, I put in a fresh sheet of trace. After doing this for an hour or so, I had a palimpsest of drawings made along these tracks. Looking at the trees in front of me I attempted to draw the truth. Just following a line with my eye and my hand on the paper unlooked at. One day I will draw one truthful line. More translucent animal track drawings. Podcast with Dean and possibly Chantal? Today I took a day off. After a leisurely morning, I decided to walk into the nearby village of Charmouth, which is by the sea. It wasn’t far, about a mile, though quite hilly. Stopped to lunch and then went to beach. Overwhelmed by all the people. I had wanted to do some fossil hunting, but it was too busy for me (being a hot, sunny day) so I just turned around and tramped home. Found out that Dean is not coming here today. Had hoped to do a podcast with him and Chantal. Am missing having someone to talk to, surprisingly. After our initial meet on the first day I haven’t spoken to Chantal much. Expected more conversation and now Dean is not coming I feel disappointed. This evening I visited the Soay sheep. Collected some of their wool from the brambles and fences, not much but it is lovely colours – soft brown and cream. Also found a lot of lichen on the ground, fallen from trees during winter storms. Great for making dyes/pigment. 4. Research how others have recorded tracks, paths, ley lines. Stitched the goat track drawings into a booklet. Have decided to go home, had planned on Tuesday, but feel I need a day free between being here and going back to work on Wednesday, just to process it all. It’s a bank holiday tomorrow, so figure I stand a better chance of a good journey by travelling today. Also, again surprisingly, I’m not enjoying sleeping in the Quiet Space. There is a ‘vibe’ in the space I can’t quite put my finger on, but I keep one of the candles lit all night. The funny thing is it’s not the whole space, which is lovely, and charmingly rustic, but one corner of the room which is quite honestly freaking me out. Odd. Time to go. It’s been an amazing opportunity, being here. So brilliant to just be able to make work without having to think about anything else. Surprised myself by how hard i can work and how much i can do when I am undistracted (and doing something I love). Walking is an act of hope, an act of rebellion, a gift, an act of suffering, an act of determination, an act that links us to our ancestors, an act that opens opportunities for our descendants. Walking is precious to me as my body stiffens and flares with arthritis. Every walk is for me an act of defiance, a joy, a statement of freedom. Ambit is a durational performance for MfOR’s Neither Use Nor Ornament which involves physically connecting with 6 artists by walking and taking public transport to get from my studio to theirs. I will create a knitted ‘drawing’ as I travel; knitting being a metaphor for connecting people and community. The (neither useful nor ornamental) object I create will evoke the white road, the beaten path made by thousands of feet across thousands of years along the hills and valleys of Britain. Every stitch a step, a braid of stitches crisscrossing every inch and representing one mile journeyed. There are 488 miles between myself and the other artists. 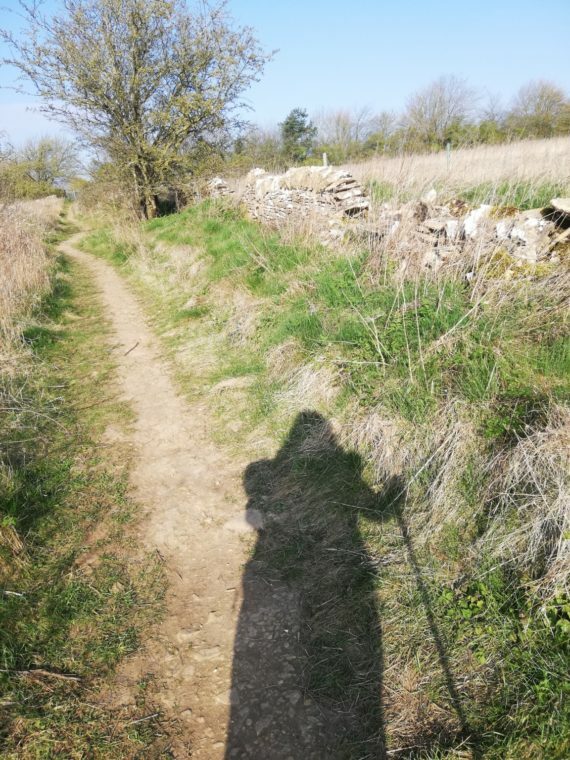 Many of the old paths, Drovers roads, country lanes and pilgrimage routes that once crisscrossed Britain are covered now with grass and fields or subsumed by tarmacked highways. The journeys that raveled along them still exist in memory and in the evidence written in our DNA. Humans are travelers. Today, hundreds of thousands of people are walking across the Earth to escape war, hunger and poverty, just as our ancestors have always done. Today, people walk also because of the damage richer nations have done to the planet’s atmosphere, causing environmental devastation on an epic scale. My own acts of walking are done mindfully; a small act of solidarity with fellow humans/refugees and the billions of creatures; insects, birds, fish and animals who are beginning their own mass journeying in the wake of the changing climate. I gave a workshop at Width of Circle gallery on the 21st July in which participants made their own origami drawing devices and then took them on a short walk. The workshop seemed to go well. A mixed group, including one child. I forgot to create evaluation forms though. People seemed engaged by the first part of the workshop in which we did some simple drawing exercises, drawing houses and thinking about mark-making. I should have spoken more about my own practice I think. The walk was interesting, we went along a local canal which gave us lots to look at. It was difficult to have conversations with people as we walked though, they scattered just as my class would have done, so will need to have breaks for the groups to stop and come together if we do this again. There were satisfying gasps of delight when people uncovered their walking drawings and saw what they had made. It was also very interesting how they were all very different, just as the ones made during the SENSE walk. 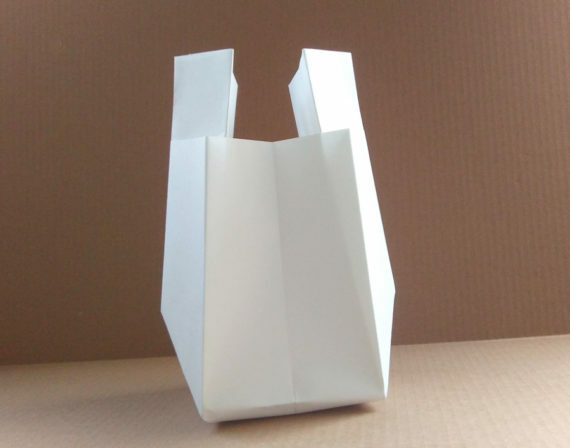 Although the origami drawing devices are easy to make, they are not very beautiful. So I need to give some thought as to how to make them lovelier. Also, I need to think harder about the outcome for the participants. If they could frame their pieces in some way maybe. 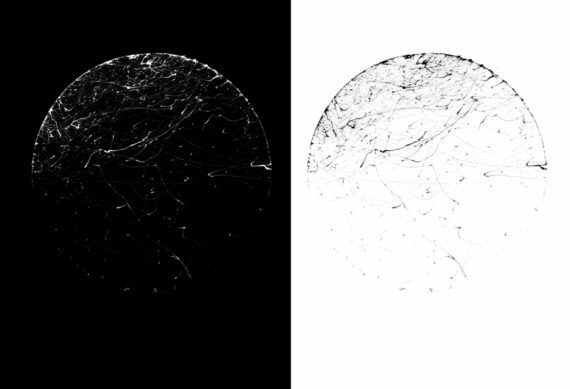 Things to do: Research generative art. Research tracks, paths, ley lines. On the 21st of June, I’m showing some work at the Width of Circle, a new, artist-led, gallery, studio and teaching space in Stourbridge on the furthest western edge of the Birmingham conurbation. Solstice is a collection of drawings made by the wind and part of my 2017 30 Days of Summer project. My work is very spare, very simple, hopefully very quiet, so physically the work will be very different to the work they have shown before. However, the impulse to seek out and connect with mystery, the numinous, to find magic in the world, that the gallery is basing it’s programme around, is also something I hope that I tap into with my work. I am having the work framed at Harris Moore in Birmingham, I very rarely get my work framed and this is the first time I have been able to afford these folks, but the quality of their work is very good and, most important, they are really nice people, so I’m pleased they are able to do this for me. Up until recently I was full of trepidation and nervous anxiety about the show, but I’ve just started the coding part of the Drawn project and all my thought is bent toward fun, digital creative stuff instead. I’m so easily swayed by my interests. They can totally take over my life, which can be both a blessing and a curse. At the moment, a blessing, haha. Solstice will be on show at Width of Circle gallery from 21st June 2018 to 21st July 2018. Opening night Thursday 21st June – all welcome. After that, visits by appointment.